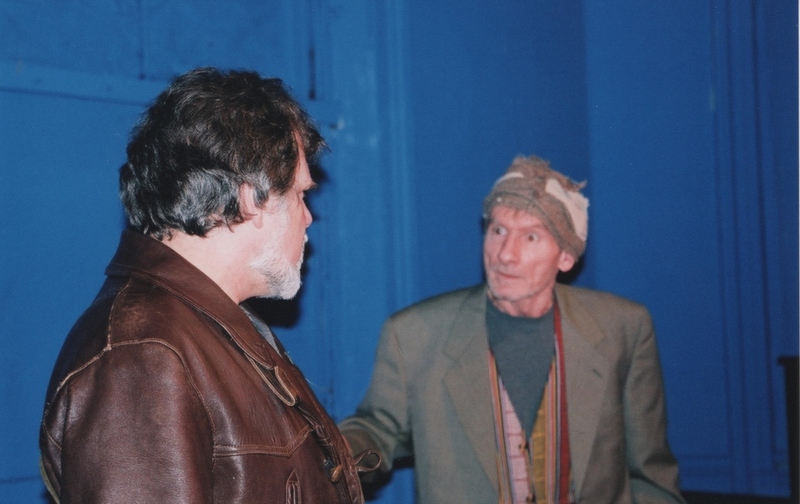 ... Violence also poisons the world of Mirita, Chris Dunkley's fictional account of life in a Kosovan Village in 1999, at the Finborough Theatre. Dunkley shows the impact of the war as occupying Serb forces turn the life of a young Albanian girl (Leah Fells) and her relationship with the sole Serb (an excellent Patrick Romer) in her village upside down. Martin Harvey's well-played production is staged with effective simplicity. It's an 80-minute drama that offers no simple moral choices but movingly conveys the corrosiveness of conflict. Balkan setting for a gripping play. When the conflict erupts, it happens between characters we believe in, with motives we understand. It's fine, focused writing, which pushes the story forward with every exchange, yet never settles for anything pat. Martin Harvey's production keeps it strong and simple, while Chris Mearing's subdued lighting draws us into the characters' moral quicksand. Patrick Romer is superb as Gregor; his uninflected performance conveys the determination of a man who knows the only goal that matters is survival. There are also excellent turns from Michael Bottle as tractor-bore Besim, who offers Mirita and her mother an unappealing way out, Daniel Barzotti as Gadic and Stephen Harvey as his uneasy CO. There are a few moments of shoutiness that break the spell. But, at 80 minutes, there's not much wasted in this glimpse of another world, not so far away. Wonderful. Mirita (Leah Fells) is a young Albanian girl who befriends an elderly Serb (Patrick Romer) living in her village during the Kosovo war. But as occupying Serb forces approach, their friendship becomes increasingly dangerous. It is hard for a shoestring production to compete with the horrific war images on our television screens but Chris Dunkley's award-winning script - which had a rehearsed reading at the Royal Court last year - does just that. The powerful writing catches how loyalty and friendship are poisoned by war but this is primarily a team effort in which director Martin Harvey draws out tension effectively and other stage effects play their part. The tree stump that dominates Kamal Desai's minimalist set is an appropriately barren image while Chris Mearing's lighting captures the sense of a Summer's afternoon as Mirita and her mother (Leslie O'Hara) share a tender moment beside a stream. This lyrical scene is particularly important for what follows as Serb soldiers Daniel Barzotti and Stephen Harvey arrive to wreak terrible destruction. Love, goodness and self-sacrifice are all cruelly destroyed and denied in these final scenes but Dunkley has built up the audience's affection for these fictional villagers so carefully that, paradoxically, we feel more for their fate than for the real but anonymous victims on the nightly news. Using the personal to evoke the universal in this way is, of course, one of the things theatre does best. This tremendously moving indictment of war deserves as wide an audience as possible. It's easy to philosophise about war from the comfort of the saloon bar or sofa and, let's face it, it's fun. Set in Albania three years ago, this sharp and gripping play by Chris Dunkley demonstrates how desperate times dissolve our easy ethical certainties faster than a speeding bullet. Teenage Mirita innocently befriends her neighbour Gregor - the only Serbian living in her Albanian village. For some reason he has decided to demolish his own house by hand - a puzzling task which seems to have something to do with the arrival in the village of a pair of Serbian soldiers. The strength of the play lies in the wry child's-eye view of ancient ethnic conflicts which the character of Mirita provides (a fresh and disarming performance by Leah Fells) as she struggles to understand why her world has erupted into chaos. Dunkley offers no slick or symmetrical moral choices for his characters: even the invading Serbian soldiers are emotionally ambivalent, especially Magovic the commanding officer with inconvenient worries about the welfare of the Albanians at his mercy. There's no knee-jerk cynicism here to let the audience off the hook either; it's the friendship between Mirita and Gregor (made credible and lucid by Patrick Romer) which saves her life and provides the heart of the piece. Director Martin Harvey draws potent performances from the cast while never allowing the crisp pacing to flag. Kemal Desai's ingenious set and the film noir mood created by Chris Mearing's lighting add to the nothing-is-what-it-seems ambivalence. The perfect antidote to the warlike bluster of politicians and the hand-wringing impotence of the rest of us. Mirita is a study of the absurd clockwork of human survival. It could hardly provide more timely theatrical therapy. A corner of a foreign field made rich with resonance. 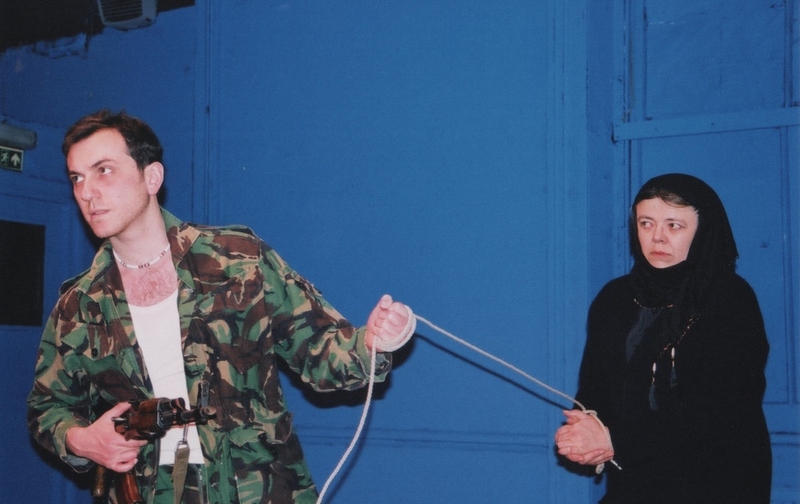 Chris Dunkley's accomplished play about the Serb/ Albanian conflict in Kosovo during the months leading to the American attacks of 1999 indicates he's a fine young writer. He's currently reading for a PhD in Drama at Exeter University, base for Blue Box whose professional production proves the script's strength. If Dunkley's writing is informed, but not submerged, by his reading he should produce notable work. He draws characters whose lives, and decisions, matter within an overall political conflict. And he uses specifics to build pictures in our imaginations. Chatty 14 year old farm-girl Mirita's sudden silence when her neighbour appears catches her instinctive, justified distrust of him. Dunkley never sentimentalises through easy resolution or easy-shock toughness. Half the characters end up dead but no death is exploited; all cement the sense of interdependent lives and the distortions of war. There is a fine performance from Leah Fells as Mirita, friendly even with old Gregor, the lone village Serb, who is demolishing his house. Her innocence contrasts the complex violence of the topsy-turvy world around her, which is ripe for irony. Michael Bottle's ill-featured farmer uses his affluence to trap Mirita into marriage. He uses her mother as marriage-broker – an elegantly troubled Leslie O'Hara looks someone from Aga and four-wheel drive farmland rather than the clod-turning subsistence her casually handled spade tries to suggest. Yet Besim's unseen, so important tractor is made ridiculous when his life depends on bribing Serb soldiers and a tractor's not what's needed. Besim's taken off to his farm; we don't learn if, on the brief journey, he thinks of a trick to save his life. Probably not; quick thinking's not his way. But this is a writer who understands when to leave a plot detail to audience imaginations. Mirita's eventual fate is left lingeringly undetermined, without seeming a loose end. Dunkley skilfully treads the line dividing the rambling from the over-neat. He sets up, then undermines, the expectation the grizzled old warrior who finally arrives is Mirita's father. He's a playwright who's aware of audiences' ways of responding and that's a fine gift for a theatre career. To address sudden and profound change has always been part of the business of the theatre. But if the change is very recent, the writer is faced with the challenge of perspective - how to make sense of it - and the danger of simply getting it wrong. Michael Billington has (rightly) complained that too much new writing fails to engage with real politics inside our life. Here are two new plays by BlueBox theatre company and director Martin Harvey which do just that - both offer perspectives which succeed in saying something original about situations we think, in a world filled with information, we know. In Bread and Circus Freaks James MacDonald takes us to territories he knows well: his own cerebral palsy and Russia, somewhere beyond St. Petersberg. In a village bread shop, Pania is counting the day's delivery, helped by Inna. The action takes place more-or-less in real time, before the shop opens for the day, and this simple device gives the play part of its power. For 80 minutes we see these lives unpacked, as the bread is being unpacked for the shop. Inna (played with moving conviction by Leah Fells) is disabled with cerebral palsy and helps Pania (Su Elliot, with sardonic humour laced with gruff care). But the day begins with stories, and these connect myths of 'Russian-ness' (exile, the wolf beyond the door) with personal narrative; with women talking about bread and poverty and the lack of men in a way that begins to show a society shattered after the Soviet regime, of people dislocated and exiled. And yet - and this is MacDonald's achievement as a non-Russian writer - from the beginning we see a dark humour running through the awfulness, a thread reaching back at least to Gogol. When the would-be bohemian art teacher Marianna appears, the humour shifts up a gear. Marianna (played with the right touch of caricature by Leslie O'Hara) seems to want to 'adopt' disabled Inna, because her own daughter is leaving. But Inna has already been 'adopted' by Pania, and so an increasingly extravagant struggle begins for the control of the girl. Add Michael Bottle's drunken, fantasising tramp Osip, lurching in to spout about a vision of death and to propse to Inna, and the situation takes another step into tragi-comic territory. When local policeman Volkov (Stephen Harvey, aptly summoning an Orton-esque copper) arrives to arrest Osip, another layer of caricature is added. 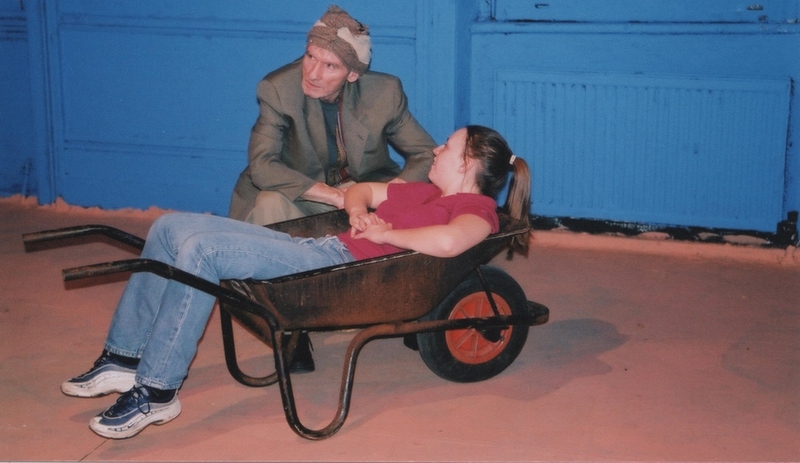 But what is successful about this play is the way those narratives which begin it, the themes of loss and exile, the 'bidding' for the disabled girl, who eventually seems to be drawn towards Osip, are maintained beneath the mounting farce. Chris Dunkley, a young playwright who has just won the International Student Playscript Competition, takes us in Mirita to Kosovo and a village where 14-year-old Albanian Mirita (Leah Fells again, with impressive energy) lives with her mother Gashi (Leslie O'Hara in a nicely contrasting performance). Next door an ageing Serb Gregor (Patrick Romer, who plays him with great subtlety and depth) is pulling down his house, stone by stone. Mirita and her mother are plagued by another Albanian neighbour Besim (an excellently greasy Michael Bottle), a man with a tractor and a full belly who hates Gregor and wants to marry Gashi, whose husband is away fighting the Serbs. Or perhaps, as he offers to take Mirita and Gashi away to safety on his tractor, he has designs on Mirita. When two Serb soldiers (Daniel Barzotti and Stephen Harvey, drunkenly realistic) arrive and expropriate the house of Mehmeti (Pippa Sparkes), the atmosphere of hatred and fear, driven by the imminent likelihood of the US bombing of Serbia/Yugoslavia, becomes filled with violence. This is powerful drama, that succeeds in showing the deep and irrational roots of 600 year-old bigotries through a glimpse into the lives and narratives of village people whom we know are likely to disappear into unmarked graves. That is a considerable achievement for a playwright, because the writing doesn't seek to lecture or apportion blame but to expose a mass of forces tearing at ordinary people, including the two murderous Serb soldiers. When Gregor, the only Serb in the village, uses his immunity from the killers to save Mirita, we may want to applaud his courage, but we know that his reasons aren't simple. He may be pulling down his house, and this may connect with a story Mirita remembers being told by her father about a man destroying his property, but we know too that he has seen all this before - that he may have been active in the killing fields himself. This makes the twist (and yet its inevitability) at the end of the play the more shocking. Both these plays connect the richness of ordinary lives and narratives with events so massive and threatening that they cannot be explained - not by village people and not, either, by two playwrights who have chosen instead to trust nuance, the significance of myth and the voices of people whom history buries to suggest and to show. Ideally the two plays should be seen together, because there are many levels of connection between them. But both are played by a very impressive ensemble, directed by Martin Harvey with an unfailing ear for the nuance and the personal voice as well as the right eye for the shocking and violent. Designer Kamal Desai's blue walls of the Finborough laid out in traverse deny the illusion of sitting in an anonymous black box, but visible, we are all drawn in, and perhaps implicated.